When transporting, lifting and rotating heavy reels, the Reel Rotator is the perfect choice! It is compact, very maneuverable and ensures the user ergonomically correct working conditions. On models with electric rotation it is only possible to rotate at lifting heights above 32.5”, so the gripping arms will not collide with the floor or legs. When heavy reels placed on closed pallets are to be transported, lifted and rotated, the Reel Rotator with straddle legs is the perfect choice! 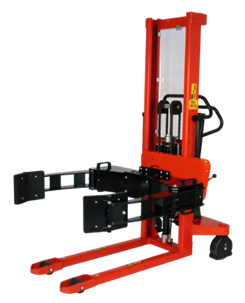 It can grip and place reels, which are located on all types of pallets. It is compact, very maneuverable and ensures the user ergonomically correct working conditions. The Reel Rotator with straddle legs is available in four unique models, with manual or electric rotation, reel fastening/releasing and lifting. On models with electric rotation it is only possible to rotate at lifting heights above 29.5”, so the gripping arms will not collide with the floor or legs.